By the sea, at the foot of National Park Strunjan Salt panes. Beautiful resort "Salinera". 300 m from the sea, 300 m from the beach, in the countryside. 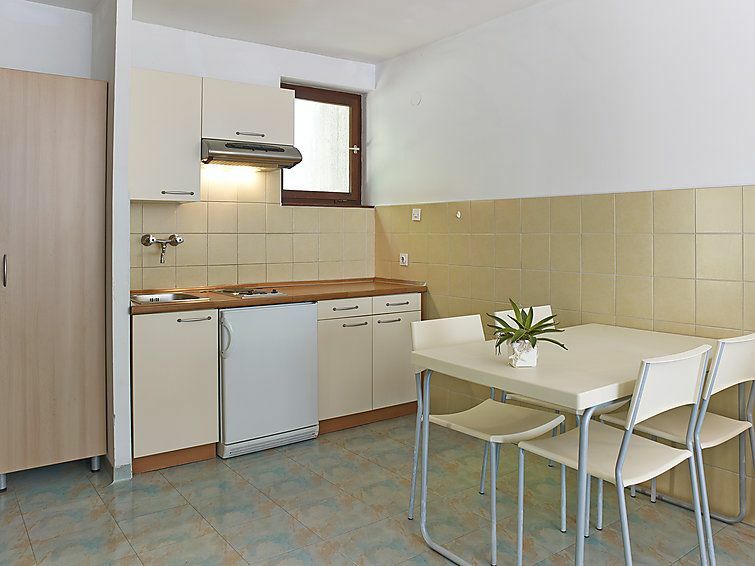 For shared use: park 5'000 m2 (fenced), swimming pool (15.06.-30.06. and 01.08.-15.09.). In the house: reception, sauna (extra). Washing machine, tumble dryer (extra). Parking. Grocery 1.1 km, restaurant 200 m, bus stop 1 km, pebble beach, shingle beach, rocky beach 300 m, outdoor swimming pool, indoor swimming pool 200 m. Tennis 3.6 km. Extra payment of registration fee on arrival: 1 EUR/person per stay. 1-room apartment 28 m2, on the upper floor. Simple furnishings: living/sleeping room, open with 3 beds, satellite TV and air conditioning. Kitchenette (2 hot plates). Shower/WC. Electric heating. Small balcony 5 m2. Terrace furniture. Suitable for families. 1 pet/ dog allowed.